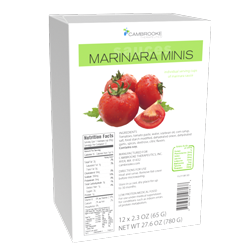 Description: Marinara Minis are 65 g individually packaged marinara cups. Serving Suggestions: Perfect served with Cambrooke's Toasted Pierogi and used for dipping or for serving with your favorite low protein pasta. Storage: Store in a cool dry place for up to 30 months. Refrigerate once opened. Ingredients: Tomatoes, tomato paste, water, soybean oil, corn syrup, salt, food starch modified, dehydrated onion, dehydrated garlic, spices, dextrose, citric flavors. Contains soy. 8/2/2012 – How many come in an order of Marinara Sauce?